_Af-x is about helping your subconscious mind learn how to respond to things differently than before. It seeks to deal with the real cause of your problems. So don't be surprised if your practitioner discourages discussion of any presenting symptoms that may have unconsciously developed from that cause. This challenging concept is the very reason for the high success rate of Af-x. Unlike the sessions in most other therapies, your Af-x Practitioner will do most of the talking and this approach only ever involves three contact sessions. An important understanding of Af-x is that it is as much 'psycho-education' as it is 'psycho-therapy'. In session one, you are helped to fully understand a number of very important facts. Why this work is about your feelings and not your thoughts or any particular event in your life. How we all have the ability to change unconscious affect (feeling or emotional) response patterns by privately re-assessing old outdated affect learnings. And why you must do this in the privacy of your subconscious mind without any intervention from the practitioner, other than a skillful guidance through this inner process. Once you are comfortable with all this, your practitioner will introduce you to the 'inner work' or quite simply 'assisted self-attention'. This introduction is designed to show you how easy this is, as 'insight mindfulness' or 'self-attention' is a natural state available to us all with a little guidance. Sessions two and three mainly involve this subconscious 'inner re-learning work', with no emphasis on reviving or experiencing past events. It's a fact that we are all constantly taking on information at levels we're not consciously aware of; just look at the effect advertising and marketing have on us at times! It doesn't matter what you consciously think happens during these sessions, what is really important is what happens afterwards as a result of the subconscious communication and learning that took place. 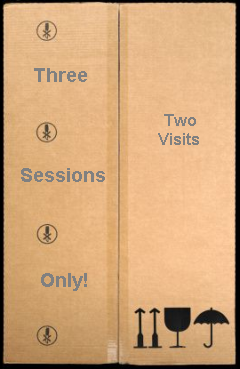 This three-session format has proven results through therapy feedback research. Your Af-x sessions are usually conducted over a short period of just 2 days. The usual schedule is for session one to be conducted on one day (2 to 2½ hours), and both second and third sessions (approx. an hour each session) close together on a subsequent day (two days, 4½ hours, in total). Af-x Practitioners regard their program as “just one session broken into three parts,” but for the sake of simplicity the work is described as a “3-session program” conducted over two visits. In many cases - particularly when clients are traveling from interstate or overseas - the full 3 segment program is successfully completed in just one day. and ask yourself these questions about "Af-x and you" by clicking here.